I'm having a real love/hate relationship with this one. I just can't figure out if the cheesecake is too strong. Cheesecake is one of those flavours that can go badly wrong if it's too strong. The juice is smelling a little strong/cheesy but the vape is great - definitely a strawberry cheesecake vape and it has a very smooth creamy nose exhale. I've made a note to myself to back the cheesecake off if it's too strong, but I'm still not sure. 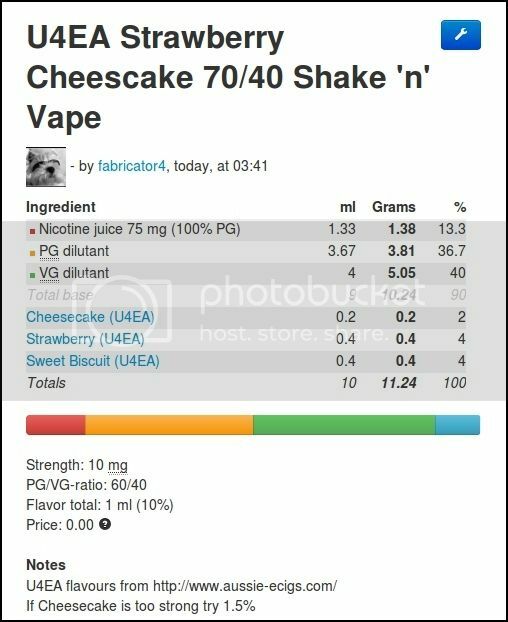 What are your experiences with cheesecake flavourings? I know it needs some sweetness to balance it, but it seems to be getting enough from the strawberry and sweet biscuit. I'm even changeable on the smell of the juice. Sometimes it smells just perfect. Thanks for that, I was wondering if that might be case. I might have to make up larger batch to steep. This one really is not going to last that long - it's actually pretty good. Aussie ecigs are quite open to any suggestions regarding flavours he doesn't stock or improvements. I paid them a few visits when he lived just around the corner from work. Hes a good bloke. Yes, I've been getting that impression from some of the comments left on his site. He was very quick to ship too; I ordered at lunch time and I had the tracking number in my inbox around 3:30. I'm also liking the U4EA concentrates I got from him. It was a good experience all round really. About the cheapest price for menthol crystals too. $8.95 for 30g which is enough to make 300ml of 10% concentrate. Enough for years the way I use it. I use a really nice one based on CAP and TFA. It's also quite easy to adjust flavour strength to your taste as you have relatively few flavours. Once you've dialed in the right amount for your personal cheesestone, enough strawberry and bakery notes, you can go ahead and dial in the sweetness with something like CAP sucralose or FA sweetener. The strength of the cheese is a hard one as it varies so much person to person hence why most store bought cheesecakes are quite bland as everyone can eat the lowest common denominator. NY Cheesecake? Yeah I have to agree, it has to be a baked cheesecake. A little coffee shop near where I first worked used to have a baked cheesecake and I'd have some nearly every day. Baked cheesecake (more of a bakery type taste) is different to the fridge set cheesecake (which is sweeter and moister). If you wanted it more of a baked cheesecake perhaps add a couple of drops of JF Bakery Super Concentrate ? Or for fridge set maybe drop the sweet biscuit by 1% and up the strawberry by 1% ? I'm thinking along the same lines as yourself that you can't really go wrong with cheesecake concentrate so maybe look at from a different angle ?